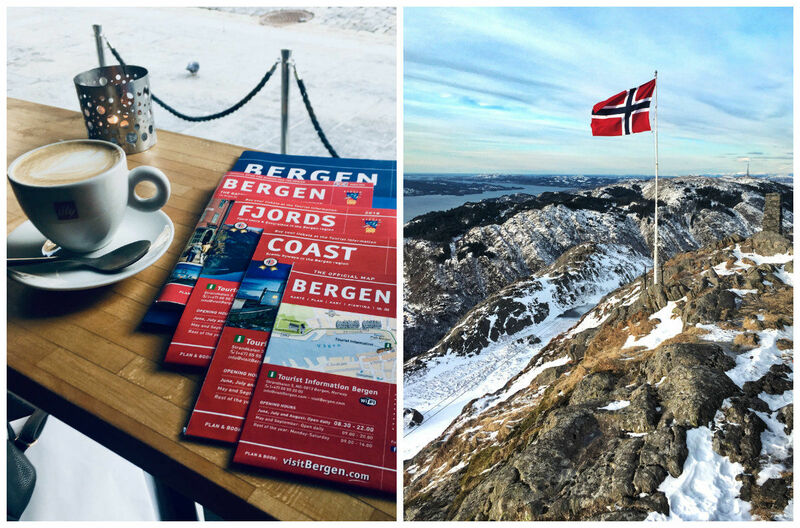 With a beautiful city center and access to stunning fjords at any time of the year, Bergen in winter is a land of awe-inspiring natural scenery. 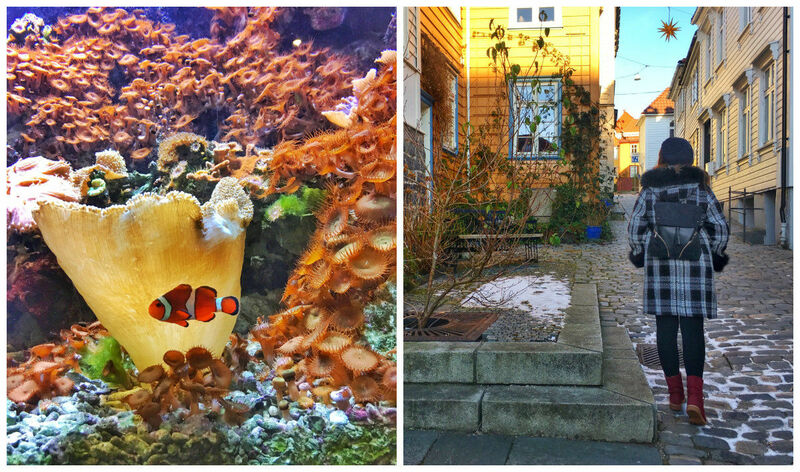 The article on One Day in Bergen was written by Marketa Bartonickova, who represented VeronikasAdventure.com during the trip to Norway. 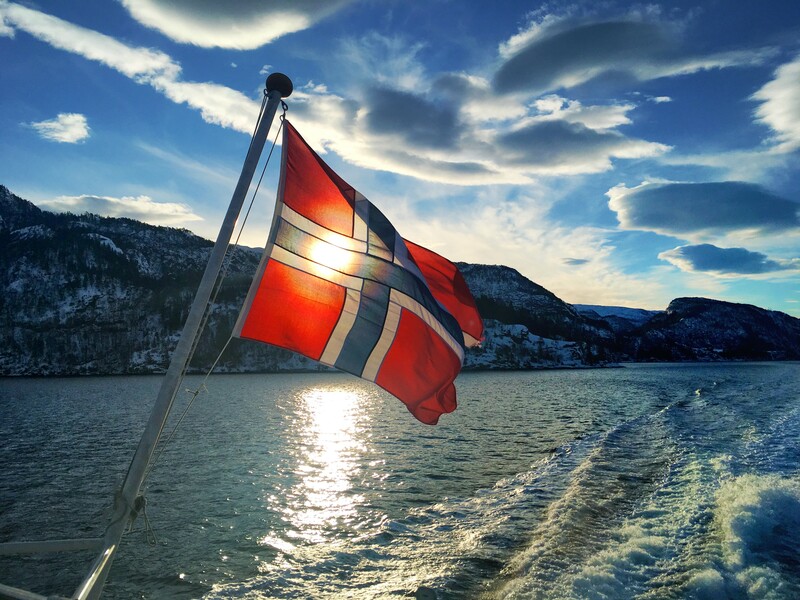 Are you really going to Norway in February? It’s cold, dark and expensive! 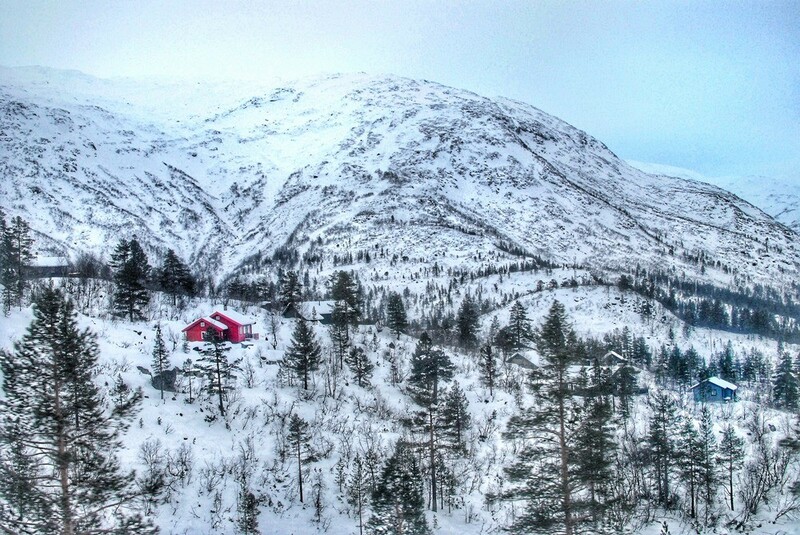 What are you going to do in Bergen in winter? These were some of my friends’ reactions when I told them that I was heading to Bergen. However, my experience turned out to be very different. Visiting the second largest city in Norway turned out to be an excellent idea. In fact, I would recommend visiting Bergen in winter to anyone. Let me make a few things clear. Why Norway? Because I haven’t been there yet. Why Bergen? Because I wanted to visit it ever since I read an interview with a student who graduated from the same university that I did and had done his Erasmus studies in Bergen. In the interview, he described just how beautiful the city was and caught my interest. And why February? Well, since I had some free time, and almost nobody travels in February so I wouldn’t have to deal with the crowds. Just to point out one more important detail: at the time of my visit, Bergen had much better weather than Brno, my city (Read about Things to do in Brno here). I traveled to Bergen with the low-cost carrier Wizzair, on a direct flight from Vienna to Bergen. It only takes two and a half hours, and if you time it right, you will only pay around 20 EUR for the flight. From the airport, you can take a Flybussen bus to the city for 75 NOK (9 USD). Alternatively, you can travel on the local train. 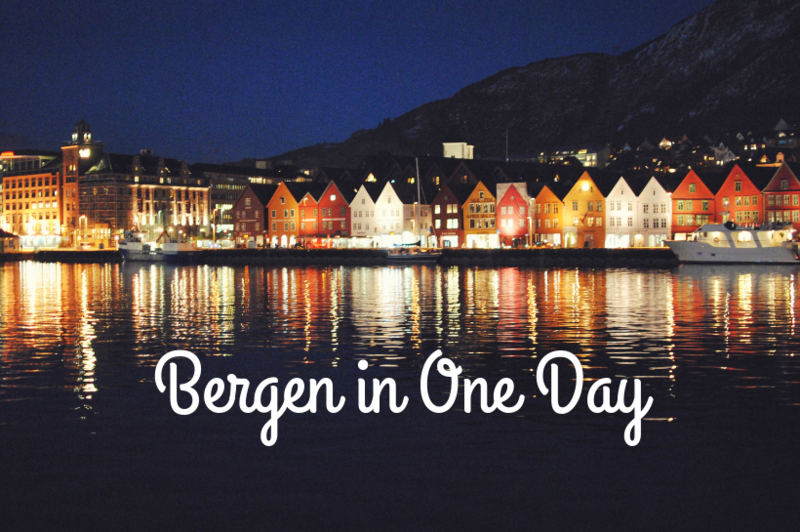 If you only have one day in Bergen, it’s fine! You can still experience the beauty of the town, along with the historical houses and other sights. Personally, I wanted to make sure I got to do a trip to Fjords, so I actually opted for a two-day visit. If I had visited in summer, I can imagine being busy for an entire week; I would have climbed every hill, enjoyed the amazing scenery from many angles, and experienced at least some of the well-marked treks in the area. But during my winter visit to Bergen, I didn’t have the courage to try them out; there was just too much snow everywhere! 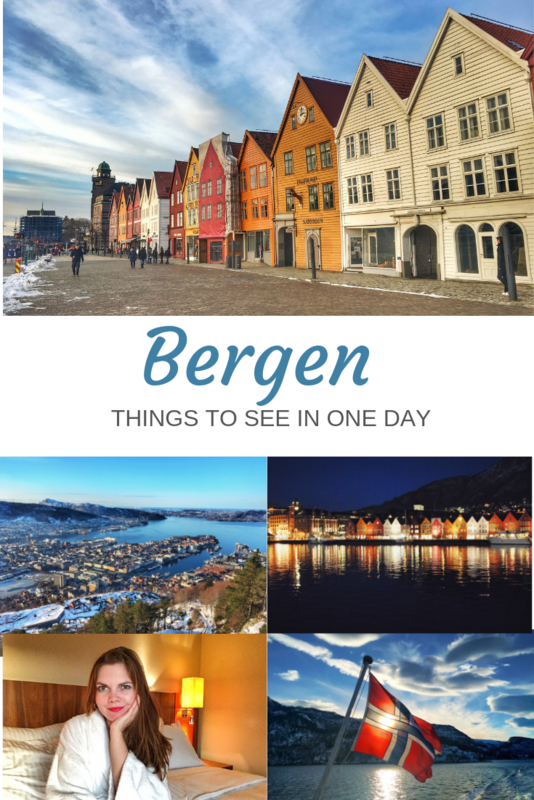 Taking into account that you will probably want to visit some of the historical sights, including the museum, and ride the cable car, I strongly recommend that you get the Bergen Card. It entitles you to free or discounted entry to most places of interest. It can save a lot of money, especially considering that all public transportation is included. You can buy it online or at the tourism office. I am not the kind of person who has to visit every museum. 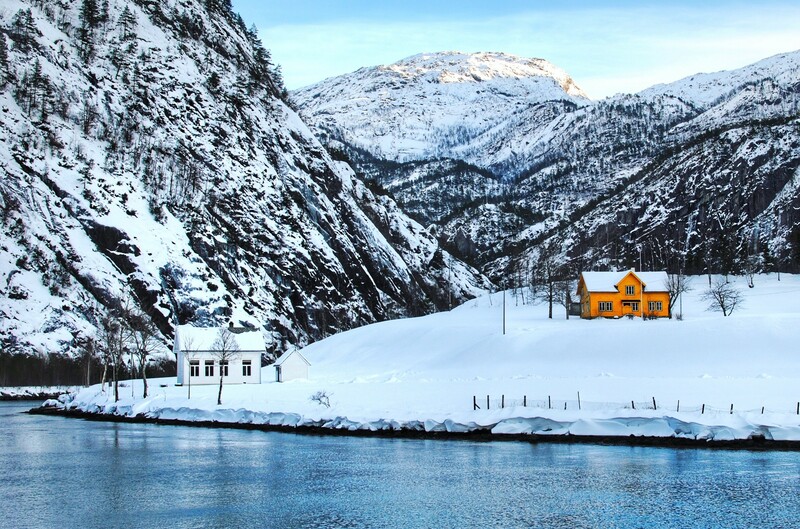 Therefore, my motivation behind visiting Bergen in winter was different; I wanted to check out the Nordic architecture and enjoy the natural scenery. 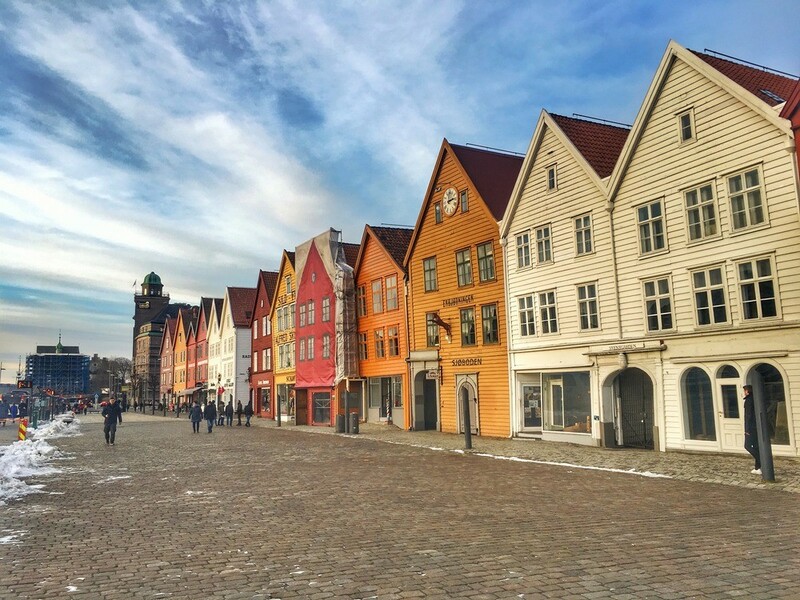 Even if you might have only one day in Bergen, you should definitely explore the old quarter. Bryggen is a UNESCO World Heritage Site at the heart of the city. The setting of wooden Hanseatic-era wooden houses, warehouses and offices are famous around the world. Alternatively, you can head to Nøstet and explore its narrow streets. I guarantee that after such a visit, you will have a sudden desire to live in such a house. I sure did! Bergen is surrounded by hills that not only provide stunning panoramas of Bergen but also feature a large number of well-marked hiking trails. There is a full range of possibilities for outdoor adventures, from half-hour walks to whole-day trips into nature. If you are the sporty type, you can even climb the hills on your own. However, if you don’t feel like putting in such an effort, or you simply want to save time (this was my case), there is a cable car that you can take. I must say that taking the Ulriken 643 cable car was an experience of its own; you just keep going up and up, above the trees, hoping that the small and fragile-looking cabin will hold together for for the ascent. And if you are really lucky, you may get the whole cabin of the Ulriken all to yourself. There is another alternative to this trip: you can also take the Fløibanen cable car up Fløyen hill. Just be aware that this is what everyone in Bergen is doing at the weekend, so you might end up in a large queue. However, the view is totally worth it. If you are visiting Bergen already, you should definitely experience a cruise around the fjords. The best thing to do in Bergen is the 3-hour boat trip to Mostraumen. The fjords are beautiful in any season, but in summer the boat trip tends to be very popular, so you might end up fighting for your photo spot on board. In winter I didn’t have this problem, but I recommend that you dress well, as it’s really windy around the fjords and the temperature feels about 10 degrees lower than in Bergen itself. Let‘s be honest; when it comes to weather, there can be some some bad days during winter in Bergen. On a foggy, windy and cold day, you might want to spend your time indoors instead. Head to the Aquarium to see different kinds of fish and crocodiles, and you can learn more about the fjords as well. In addition, they feature frightening information about how the polar glaciers are melting and how much trash we throw each day into the oceans. Did you know that in one albatross, about 170 plastic seals from inside bottle caps were found? In fact, you can never run out of things to do in Bergen. Another must-visit spot is the Magic Ice Bar, where everything is made of ice, including the glasses. Inside, you have to handle a temperature of -5 °C. Upon entering, you get a pair of winter gloves and a poncho to keep warm. However, I would just recommend to visit when you are in Bergen in winter, since you will be wearing warm clothes already. Despite the low temperature, it’s really cozy inside. You can definitely spend about half an hour or an hour in there without freezing. As a welcome drink, you will get a cocktail made of Scandinavian cranberry liqueur in a glass of ice (put in a normal glass so that you are able to hold it:)). The bar itself is a piece of art; for example, they feature works by Gustav Klimt carved from ice. By the way, the staff is accustomed to taking photos, so be prepared to sit down on a throne of ice and pose for pictures. The only museum I visited in Bergen was Bergenhus Festningsmuseum, focused on Norwegian war history. In fact, I didn’t go there on purpose. Honestly, I was just walking around and it was the guy at the door who lured me in. Admission is free because everything is sponsored by the Norwegian Army (including coffee and tea for visitors). Even if you are not interested in warfare, you will learn, for example, what Bergen looked like during the Middle Ages. It’s pretty interesting. 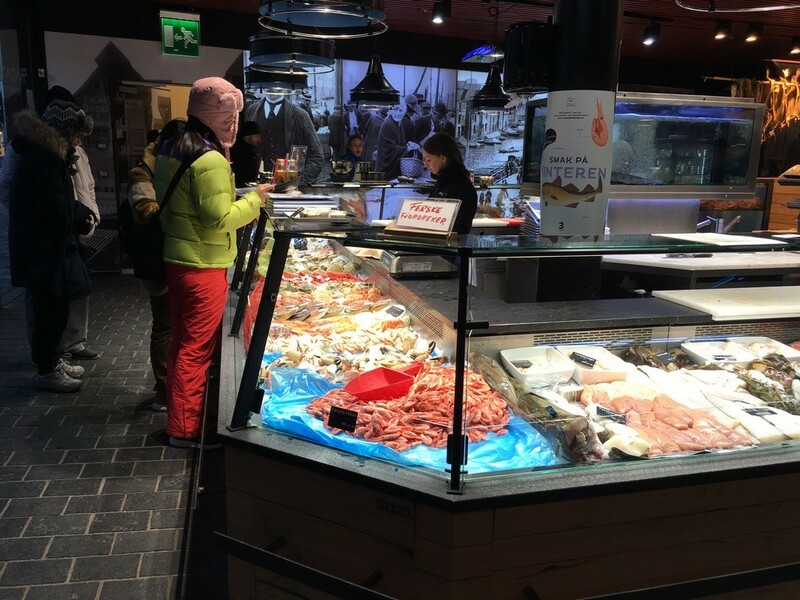 The best place to try local food is the fish market: you can make your choice and they will serve it to you directly. However, you have to be prepared for the price: you will pay a minimum of 18 USD per person, which is also the starting price of meals in most restaurants. If you’re on a budget, one alternative is to get sandwiches from the supermarket, which are surprisingly tasty and filling. You can fill up for under 5 USD, which is a very good deal in Norway. Norwegians, like all Scandinavians, appreciate good coffee. So you should definitely visit one of many coffee houses. It is a nice way to relax and keep warm while visiting Bergen in winter. You can get a cappuccino for 4–5 USD. The best place to try the local food is the fish market: you can make your choice and they will serve it you directly. However, you have to be prepared for the price: you will pay a minimum of 18 USD per person, which is also the starting price of meals in the restaurants. When it came to accommodation in Bergen, I stayed at the Radisson Blu Royal Bergen, situated in the heart of the old town. Apart from the handy location, I loved their cozy rooms and the spacious bed. I didn’t have time to take advantage of the large TV with an astonishing number of Norwegian channels, but what I appreciated was the perfectly working Wi-Fi around the hotel (surprisingly, this has not been the case in all hotels I‘ve stayed in before). The hotel is well equipped both for business and regular travelers, and there’s a steamroom and sauna open from 6 a.m. to 11 p.m. The best part of staying at Radisson Blue was, however, the royal breakfast served from 7 to 11 a.m. Guests who wake up late could even have it as brunch. It is a really convenient thing to eat a decent meal before you depart from a hotel, especially if you have a long trip ahead. For the royal breakfast, they offered both salty and sweet options and no matter what diet or allergy you might have, you will eat well here. Once you‘ve had enough of Bergen, it is a good idea to embark on some day trips by train. You can travel in pretty much any direction and the scenery will be breathtaking. Well, except for those moments when you’re driving in a tunnel, which is unfortunately very common around Bergen. The scenery is really stunning no matter where you go. From my own experience, I totally recommend the route to Oslo. For the stunning 7hour trip, I only paid 30 USD. Of course, the prices can vary based on the day and season, with Sunday being more expensive than any other day.